Akhil Bharatiya Marathi Natya Parishad Belagavi branch is holding a 4 day theater festival at the Auditorium, Angadi College, Savagaon road from December 26 to 29, 2017 every evening from 6.30 PM. The drama lovers will get a treat of the new age dramas which hardly come to Belagavi. Venugram te Samrt city – Sound and light show based on the book of M J Stokes “ an historical account of Belgaum District” and various Gazettes. The show which will have live artists, sound will showcase the history of city and its journey towards Smart City. Hamlet — MB thetare’s “Hamlet” is produced and directed by Kolhapur based Mandar Bhanage who also plays the lead in the drama. 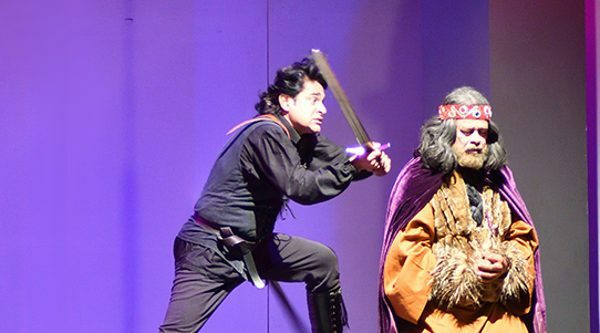 This is based on Shakespeare’s The Bard’s “The Tragedy of Hamlet, Prince of Denmark” and is based on the Marathi translation of Hamlet done by Parshuram Deshpande. The drama was also awarded at the Cuttak international drama festival with three national awards. Ek Shunya Seemaresha – the drama has been produced by the Akhil Bharatiya Marathi Natya Parishad Belagavi branch, written by Medha Marathe and directed by Veena Lokur. The drama is based on the life of people at the Bangaldesh Border.